Since the end of Apartheid and the establishment of a democratic government in the 1990s, South Africa's borders have opened to a flood of tourists who come to enjoy the country's stunning natural beauty and vibrant culture. South Africa's sense of history is strong, and visitors have the chance to explore important historical attractions, including the battlefields of KwaZulu-Natal, the Apartheid Museum in Johannesburg, and Robben Island, off the coast of Cape Town. South Africa is one of the most culturally diverse countries in the world. It has 11 official languages, and its colourful population draws their heritage from African, Asian and European cultures. Whether browsing the Indian markets in Durban, enjoying a shisa nyama (barbecue) in Soweto, or tasting celebrated local varieties at a winery in Stellenbosch, visitors will encounter a warm welcome. However, the true lure of South Africa lies in its untamed wilderness. Home to the Big Five of African wildlife (lion, elephant, leopard, buffalo, and rhino), along with thousands of other species of plants and animals, big game safaris in nature reserves like Kruger Park and Hluhluwe National Park remain among the most popular activities in South Africa. The landscape encompasses a range of climates and terrains, including deserts, mountains, plateaus, grasslands, bush, wetlands, and subtropical forests. The climate of South Africa varies markedly between regions, making it important for travellers to research the specific regions they are visiting. Generally, the best time to visit South Africa is late spring (October and November) and early autumn (March and April) to avoid the intense heat of summer and the cold and wet winters in the Cape. However, many tourists relish the hot summer months between December and February. Read more on South Africa's Climate and Weather. -Get up close with the Big Five and other wildlife in the Kruger National Park. -See Nelson Mandela's former cell at Robben Island Prison. -Ride the rollercoasters and try your luck at the casino in Gold Reef City. -Take a township tour through Soweto and Alexandra. -Have a drink in the sunshine on Durban's Golden Mile. Read more about South Africa Attractions. -Go scuba diving in Sodwana Bay. -Ride a cable car to the top of Table Mountain for spectacular views of Cape Town. -Go wine tasting in the vineyards of Stellenbosch and the Cape Winelands. -Learn to surf in Coffee Bay. -Face your fears and go shark cage diving in Gansbaai. Read more about South Africa Activities. Direct flights to South Africa from the US are long, but are generally available from Atlanta, New York, and Washington DC. Flights to South Africa from the UK and Europe are more plentiful. Unfortunately, because of the relatively long distance from both Europe and North America, flights to South Africa are rarely cheap. Most flights to South Africa land at OR Tambo International Airport in Johannesburg, but there are some direct flights to Cape Town. Get more information on South Africa Airports. Country of My Skull by Antjie Krog, The Long Walk to Freedom by Nelson Mandela, Cry the Beloved Country by Alan Paton, The Power of One by Bryce Courtenay, and Ways of Dying by Zakes Mda. Freshlyground, Ladysmith Black Mambazo, Hugh Masekela, and Miriam Makeba. Invictus (2009), Amandla: Revolution in Four-Part Harmony (2002), Safe House (2012), and District 9 (2009). South African wine from the Cape Winelands, locally-produced beer like Jack Black and Mitchell's. Cape Malay curries, boerewors, or a typical Durban 'bunny chow'. Ndebele beaded jewellery, wooden and soapstone carvings. Pack malaria tablets if you're heading to Kruger, and lots of insect repellent. The Hermanus Whale Festival celebrates the arrival of dozens of humpback whales each spring. The National Arts Festival in Grahamstown hosts the best music, art, theatre and comedy from around South Africa in July. The world-famous Comrades Marathon is run between Durban and Pietermaritzburg every year in May. More information on South Africa Events. -Nelson Mandela and Archbishop Desmond Tutu both had houses on Vilakazi Street in Soweto, making it the only road in the world to house two Nobel Prize winners. 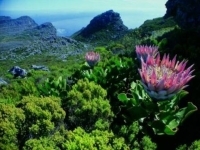 -70 percent of the Cape's plant species are not found anywhere else on the planet. -South Africa has the third highest level of biodiversity in the world. The culturally and environmentally diverse landscape of South Africa is the ultimate holiday destination for adventurous travellers.